They're Back! Hot Pops, Hooray! Transitional seasons are notoriously tricky. At the beginning of spring and the start of fall, much change is in the air (pun intended). As October continues on, the leaves are turning fiery oranges and reds, the night air is getting cool and crispy, and, worst of all, my 6:30 am walk to work is now completely pre-sunrise. It’s the time of year when I’ll meet a friend for dinner wearing my sandals and t-shirt and she’ll be in boots and a wool sweater. At Pleasant Pops, October means one day our outdoor tables will be full of laptops and iced lattes and the next everyone’s crowded inside sipping on hot pumpkin chais. I like these transitional times, where you need to be on alert at all times, opening doors for fresh air in the morning and cranking up the heat in the afternoon. And I love these times at Pleasant Pops because it means two of my very favorite things: grilled cheese and hot pops. Today, let’s dive into the latter, but don’t worry, I intend to write at length about grilled cheese soon. If you’ve only recently discovered Pleasant Pops, you might ask “what are hot pops?” and “why should I care?” To these questions I answer “hot pops are an amazing, decadent and utterly addictive kind of DIY hot chocolate” and “you should care because they will change your DC winter experience entirely”. When we first expanded Pleasant Pops from being just a pop cart, it was important to create a business that could be successful year round. Sure we have our amazing coffee bar which constantly alternates between iced and hot beverages, and our lunch and dinner menu that changes seasonally, but we knew we wanted a special treat for the winter. And since our ice pops are the perfect anecdote to a DC summer day, we thought there must be something equally yummy, equally creative and equally Pop-tastic to answer a crummy DC winter. And thus, Hot Pops were born. We are currently offering four flavors of hot pops in the store: Milk Chocolate, Salted Chocolate, Mexican Chocolate and Dark Chocolate. (Come December we’ll add a fifth flavor, Peppermint Chocolate, to the menu.) Each Hot Pop is a cube of chocolate blended with different ingredients and served on a pop stick (for ideal stirring capability). The milk chocolate, our most popular, has mini marshmallows on top, the salted chocolate is topped with sea salt crystals, the Mexican chocolate has both cayenne and cinnamon, and the dark chocolate is totally dairy free. 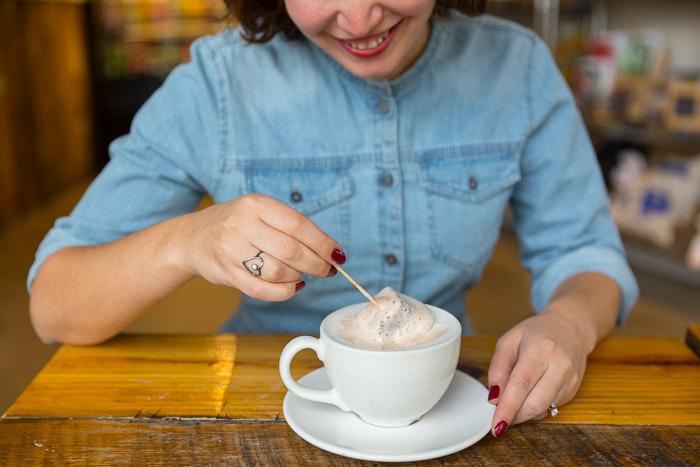 If you order a Hot Pop in the cafe we will serve it alongside a cup of steamed milk, allowing you the fun task of stirring it together (or licking the melting chocolate directly off the stick, my own personal method). We also sell them in packs of two for you to take home and devour on your own schedule. Though today is actually a perfect ice pop day (cranberry apple pop coming soon! ), I bet tonight will be perfect Hot Pop weather. If you’re not quite feeling the need to cuddle up with a good book, comfy blanket and supremely delicious hot pop yet, don’t worry. They’re here all winter long and I promise one night soon a Hot Pop will turn your soggy winter night into a magically delectable evening.